British Prime Minister David Cameron called the referendum in an attempt to settle a long-running dispute in the country about the value of its EU membership. Cameron, who led the campaign for Britain to stay in the EU, announced after the result that he would step down later this year to allow someone else to "be the captain that steers our country to its next destination". He said he would not formally begin the process of leaving the EU himself, and would leave that to his successor. 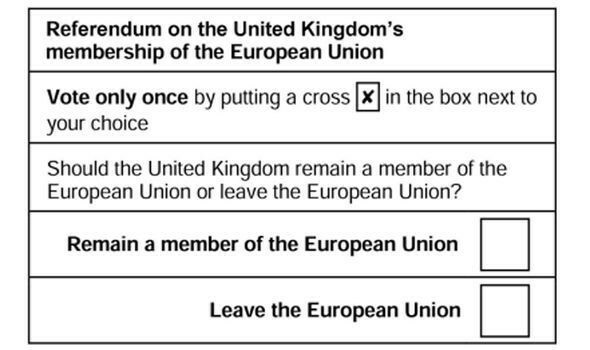 The result of the ballot casts a pall of uncertainty over the future of the UK, the future of the EU, and the global economy. Markets panicked, with analysts citing "a wave of economic and political uncertainty". 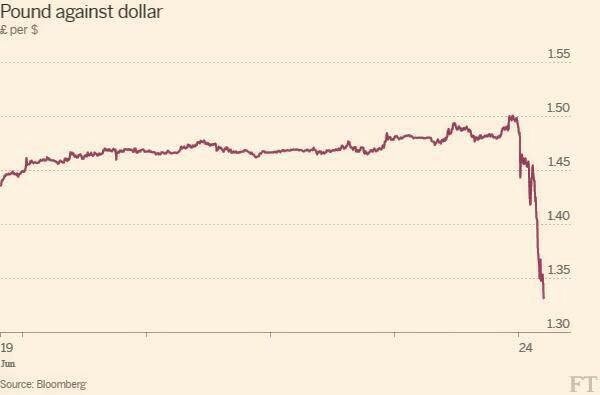 The pound fell to its lowest level in decades, losing over 10% in a matter of hours. There were national differences between the four countries that make up the United Kingdom, with Scotland voting to remain in the EU by 62% to 38%. The First Minister of Scotland and leader of the Scottish National party, Nicola Sturgeon, announced plans for a referendum on Scottish independence, the second in two years, and visited Brussels the following week to discuss options with European officials. European leaders, including the presidents of the European council, commission and parliament – Donald Tusk, Jean-Claude Juncker and Martin Schultz – and Mark Rutte, the Prime Minister of the Netherlands, encouraged Britain to start the process quickly, as any delay would "unnecessarily prolong uncertainty". Under the terms of the EU Lisbon Treaty, a country that wishes to leave the union can do so by launching proceedings under Article 50, which puts the EU and the country in question under a two-year deadline to negotiate the terms of the "divorce settlement". It would be a significant diplomatic, legal and bureaucratic endeavour. Although European leaders are urging a swift Brexit, Cameron said that he would not personally trigger Article 50, and Boris Johnson, a leader of the campaign to leave the EU and a possible candidate for the prime-ministership, said that there was "no need for haste". European leaders met the week after the referendum in Brussels to discuss their approach to negotiations with the UK on a possible exit. They said that no negotiations would be entered into until the country triggers Article 50, and emphasized that Britain will not be able to "cherry-pick" the parts of the EU that it agrees with, such as the single market, without accepting the principles that go together, such as free movement of people. That puts Britain in a difficult position. Its new leader, to be appointed by the Conservative party by September 9, will have to navigate between starting the clock on negotiating an exit with the Europeans, negotiating with the electorate with delaying tactics, and holding a fresh vote. What does Brexit mean for the UK economy?